Dread updating WordPress? Don’t! I am going to tell you exactly how to update WordPress, plugins and themes safely. It’s always good idea to have a backup plugin and make a backup of your site before updating plugins, themes or the WordPress core. Plugins like Backup Buddy or Updraft are dead easy ways of making backups and restoring, should your site be un-repairable for any reason. Have a maintenance mode or under construction plugin to keep your site looking pretty on the front end while you make updates in the back-end, I like Under Construction by Web Factory. You can add in your own contact details to the page that shows up while your updating, so visitors can still get in touch! Once your maintenance mode plugin is activated then it’s time to deactivate all your plugins, apart from the maintenance mode plugin! Don’t worry your plugins will remember their settings. If you’re using a theme that is not a default WordPress theme by Automatic, like Twenty Seventeen, then activate one of those to deactivate your own theme. What you have done with the above it switched off all extra coding to your site and brought it back to as basic a site as possible before updating, this is the safest way to update any of your WordPress plugins or it’s core. Now you are set to update the WordPress core and plugins. One thing that you should take into consideration before updating the core is to make sure your plugins are compatible with your the version of WordPress. If you have a particularly important plugin that is not compatible with the new version of WordPress then you need to contact the developers to find out when the new release will be that will be compatible, you don’t want to hang on for too long with an outdated version of WordPress. I usually update the WordPress core before any of the my plugins, keeping WordPress up to date is especially important for the security of your site, each time there is a new release hackers have to go back to the drawing board to work out how to get into the new version, also you’ll get cool new features! 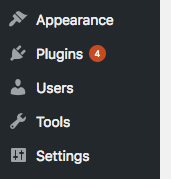 Once the WordPress core is updated I then update the plugins one by one (just to be on the safe side). After I’ve updated my plugins, without activating them I go on to update my theme (if required). Some themes need to be active to update them that’s OK, you can update them as long as all your plugins are still deactivated. If anything is going to cause an issue, it’ll be your theme or a plugin. Reactivate your theme first and then your plugins ONE BY ONE. If you have issue after activating or you get the white screen of death don’t panic, you’ll know the offender as it’ll be the last thing you activated, just go into your FTP and rename that plugin or theme to deactivate it. Refresh your browser and your site should come back up. I like to check the front-end progress of my site while I activate each of my plugins, so I’ll have one browser tab open on the back-end and another on the font-end of my site that I can refresh each time I activate the next plugin and check it’s looking right. Sometimes when you deactivate and reactive a different theme you’ll find your widgets have gone missing, this is because the theme you activated whilst updating may not have had the same widget areas your own theme has. You’ll find they have been either been dropped into “Inactive Widgets” or have been placed in another widget area, so you may need to move them back when you reactivate your theme. Eventually you’ll have all your plugins activated, widgets back in place and and your site update will be complete, yippee! !